We’re pleased to announce updates to both Old Bailey Online and London Lives. Key changes are summarised below. The updated XML data will be made available shortly. One unwanted change is that, following extensive discussion about its feasibility, the map search that was removed from Old Bailey Online in summer 2016 (following a security incident) will not be reinstated. We very much regret this loss of functionality, but an alternative mapping facility is available at Locating London’s Past. A very small number of rarely-used options in the ‘advanced’ keyword search also cannot be reinstated. There are no plans to restore the London Lives wiki, but if anyone contributed material to it that they would like a copy of, we may be be able to retrieve it on request. Old Bailey Online user workspaces have not been restored in this update, but we still hope to be able to do this at a later date. User accounts and workspaces on London Lives have now been restored, but please note that users will need to sign up for new accounts and it will not be possible to retrieve data from the original workspaces. I think that all other functionality, on both sites, that was suspended in summer 2016 should now have been reinstated and work as it did before. We’ve tested restored search functions extensively, but there might still be some unexpected bugs given the complexity of some search forms. If you encounter any issues or anything doesn’t work as you think it used to, please let us know, giving as much information as possible. If you have research needs that go beyond the capabilities of the Old Bailey Online and London Lives websites, we are endeavouring to encourage the use of our XML data and Old Bailey API. I plan to post more about this in the near future. Links have been added from individual trial accounts to relevant ‘Life Archives’ of convicts in the Digital Panopticon online resource. This allows you to find out what happened to defendants convicted at the Old Bailey between 1780 and 1870. We have added a new Access to Old Bailey Online Data page which lists current options for obtaining our text data, in order to encourage re-use. We have also updated the page listing Digital Projects Using Old Bailey Data, which has several examples of ways in which the data has already been used. We have taken the opportunity to correct a number of bugs in the search functions, textual and tagging errors, and broken links. This was relatively minor compared to the previous update, but users should note that this may mean that sometimes search results will differ slightly. As always, we recommend ensuring that citations include the site version number (indicated in the site footer and ‘Cite this…’) at the time of the search. User accounts and workspaces have now been restored. To create a user account see How to Register. Registered users can once again use workspaces, but material that was in workspaces before August 2016 has not been restored. We’ve added a supplement to the bibliography listing recent publications that cite London Lives as a source. Join the Old Bailey Online team at the launch of the new exhibition Criminal Lives, 1780-1925: Punishing Old Bailey Convicts! The exhibition is a collaboration between the Digital Panopticon and the London Metropolitan Archives. The launch event is on 14 December 2017; it’s free to attend but space is limited, so please register here. The exhibition runs at the LMA from 11 December 2017 to 18 May 2018 (free admission). Between 1700 and 1900, Britain stopped punishing the bodies of convicts and increasingly sought to reform their minds. Exile and forced labour in Australia and incarceration in penitentiaries became the dominant modes of punishment. This exhibition uses the collections of the LMA and the life archives assembled by the AHRC Digital Panopticon project to trace the impact of these punishments on convict lives. Regular users may already be aware that following a recent security incident affecting the servers on which the websites are hosted, Old Bailey Online has been operating with extremely limited functionality and London Lives has been unavailable. This is just a brief notice to readers that both are now up and running, and although service is still limited, they have the core functions of keyword and name searches, date filters and reference search for both sites; crime/verdict/punishment search for OBO; document type selection for London Lives (as well as browsing by documents/dates). Document images are now displaying as well. We’re very sorry about any ongoing inconvenience the limitations may cause site users; please bear with us as we gradually get back to normal. However, as functions are re-introduced, they may be buggy at first and if you find something on the sites doesn’t seem to be working properly, please don’t hesitate to get in touch: you can email oldbailey@sheffield.ac.uk or send a tweet to @oldbaileyonline. The new book by Tim Hitchcock and Robert Shoemaker is due out in August 2015 and now taking pre-orders: London Lives: Poverty, Crime and the Making of a Modern City is the outcome of several years’ work on the London Lives project. Our latest site update (version 7.2) is now live! * The main news for site users to be aware of – especially those who use the statistical functions – is that we’ve done a lot of work correcting data errors. The removal of erroneous defendant status tagging from about 800 husbands. About 100 mistranscribed defendant ages have been corrected. Many defendants previously tagged as 80 and above are now correctly listed as being in their 20s or 30s. About 850 genders previously listed as “indeterminate” have now been correctly labelled as male or female. In some cases the original “indeterminate” tag resulted from a mistranscription of a forename, and these mistranscriptions have been corrected. The date of the 13 June 1836 session of the court was previously wrongly listed as 13 July 1836, owing to a mistake on the original title page. The date of the 30 May 1770 session was wrongly listed as 30 June 1770. Correction of these errors has necessitated changing all trial references for those sessions, so for example, t18360713-1634 is now t18360613-1634. If users search for the previous trial numbers they will receive an error notice and be advised to correct the reference. Phew! If you’re in the process of doing research that may be affected by any of this you should probably review your data now. If you might be affected by it but are unable to revise your work I’d strongly recommend that you ensure that all citations include the previous version number (7.1). We have limited time available for corrections so we prioritise certain errors – tagging of names, offences and outcomes, in particular. Errors in transcription outside those priorities are much less likely to make the cut. Conversely, a few corrections always turn out to be unusually awkward and time-consuming (this can be particularly true of problems with images) and have to wait for a later update. An inaccuracy in the API documentation has been corrected. Finally, there was also some work done updating the site server and backend code. We think this has all been thoroughly tested and any issues ironed out, but if you encounter any problems with the site please do let us know. You can leave a comment below, on twitter @OldBaileyOnline or email oldbailey@sheffield.ac.uk. As with any historical event, rediscovering the truth behind a Victorian crime and its key protagonists requires access to as many archives as might survive. When the main character’s journey takes them from murderess to death row prisoner, penal servant to asylum inmate, its availability – and perversely, relative scarcity – soon becomes the be-all-and-end-all of the researcher’s task. This post looks at each of the social and administrative stations the criminal and her case encountered; how the vagaries of each affected what material was produced for the modern day researcher to discover; and how each directly influenced the biography and criminal history of a given individual. Celestina Sommer gained international notoriety after murdering her illegitimate daughter in the cellar of their Islington home. Her unrelenting tale of sorrow, infanticide, capital punishment and an unchecked descent into madness, paints a vivid picture of the darker elements of institutional Victorian England – at exactly the time when organisations and social administrations were changing, for ever. Digging deep into the surviving archives a century and a half later, The Secret Life of Celestina Sommer* has emerged as the first (as far as I know) full and accurate retelling of one of the period’s most notorious but since inexplicably forgotten killers and the awful crime she committed. Putting flesh on the bones of both Celestina Sommer the woman and her case required availability of records from before, during and after the central, horrific event. The breakthrough came with the online transcript of her Old Bailey trial, and marked the beginning of the period during which she ‘justified’ the numerous, extensive records that were created about her short, eventful life. 1. The Proceedings/Old Bailey Online/London Lives – These “quasi-official” records of court proceedings (trials) at the Old Bailey are an invaluable source of information and social data. From their advent in 17th century – more as a popular account than an authoritative record – were soon seen to be the only means of accessing events in the Central Criminal Court outside the courtroom. The survival – and digitisation – of the trial of Celestina Sommer (t18560407-457) gave arguably the clearest opportunity to unravel this woman’s crime and, by extension, to delve into her short yet eventful life story. A word or two of warning – trying variations of spellings, especially of names, was essential. Celestina was recorded as Celestika [to be rectified], so that it took several attempts to locate her records on the otherwise faultless Old Bailey Online website. Furthermore, as with all research that uses primary and secondary data (shouldn’t it all? ), everything was double-checked and verified, while bearing in mind any subjectivity inherent in any written text. The commercial reality behind the original Proceedings meant very little of the defendant’s perspective was heard, making it far more salacious if less equivocal! Finally, no matter how exciting it was to find what I was looking for, I was never misled into thinking there were no other records – accounts or official documents – including those that may not survive. For example, Celestina faced two magistrates hearings and two Old Bailey appearances. Only records of the main hearing were found. 2. Police records, from the earliest days of the Metropolitan Force, proved scarce in Celestina Sommer’s case. Despite their central role in the unfolding drama, the police archives failed to provide even scant information about the crime or the accused under investigation. 3. At Magistrates hearings – in Celestina’s case at Clerkenwell Police Court (not to be confused with its police station namesake) – no formal transcripts were likely to have been made. Instead, press reports (full of subjectivity and prejudice) were relied on and, even in the arguably more bowdlerized 19th century, their practices and writings were far from reliable. For example, they prematurely reported the “facts from” the second magistrate’s hearing before the hearing was held. Sub judice, indeed! 5. Parliament – Celestina Sommer’s criminal ‘career’ received great political and legal attention – both for her act and for her subsequent treatment by the Victorian social system(s). That she featured in several debates on crime, insanity and the death penalty, in both Houses, is testament to the uncertainty surrounding her treatment, and her infamy. Transcripts of these debates were retrieved from Hansard et al; while comments, both favourable and hostile, were delivered through the writings of penal reformers like Alfred Dymond, Secretary of the Society for the Abolition of Capital Punishment. 6. Prison – Her prison records are equally as limited: the registers captured little more than her physical and legal attributes – name, age, marital status, ability to read or write, crime, conviction and sentence. Yet, by augmenting this limited primary data with interpretative secondary sources – such as Dixon’s London Prisons (1850) and Mayhew and Binny’s Criminal Prisons of London (1862) – it was still possible to build a reliable picture of Victorian penal life. Elements of greatest import to the Victorians – those of religion, education and, crucially, prescribed gender roles – all received undue attention in the records of the institutions and their undertakings. 7. Fisherton House Lunatic Asylum – In the early to mid-Victorian age, with its uncertain understanding of insanity and its role as an exculpatory factor for criminal acts (viz. the insanity plea), a diagnosis of the defendant’s mind was fiercely debated and his or her future precariously balanced. The political writings from both sides of the debate are now all we have to go on – along with modern day academic assessments by people like Roger Smith and Andrew Scull. As soon as Celestina Sommer’s insanity was eventually acknowledged, she was transferred to Britain’s largest criminal lunatic asylum, near Salisbury Wilts. Records there, though limited to her medical history and records of administration, allowed a detailed portrayal of her final days on earth and deductions about her underlying conditions. 8. The press – As already inferred, detailed comment and passing references alike were often subjective and derogatory. For example, Sommer was spared the gallows because she was German (actually not, though she was married to a Prussian immigrant; a woman; a pretty woman; any other spurious reason the reader can think of! The truths and inaccuracies within this particular source were recognized when comparing the scores of articles and reports found within a multitude of surviving and/or digitized titles. From the execution of her crime, to her final demise within the confines of a lunatic asylum, compassion for Celestina Sommer’s mental health was seldom forthcoming. No reference to any discussion/debate on her possible madness was found, despite the prevalent taste for insanity and criminal lunacy in this age of social reform. In consequence, a huge slice of the peculiar circumstances behind her experiences was potentially overlooked. Nevertheless, through careful and thorough research of all known available sources, facts were unearthed, verified and used. Primary and secondary source material may have its depth and accuracy devalued by an inherent lack of hard evidence, hidden agenda and ample rhetoric, but by working, dare I say, systemically, I was at least able to retell her story by judiciously piecing together the records – and rejecting the rhetoric – from her short and tragic life. As a professional historian and author, David’s first published book is due out this summer: (Bloody British History – The History Press). 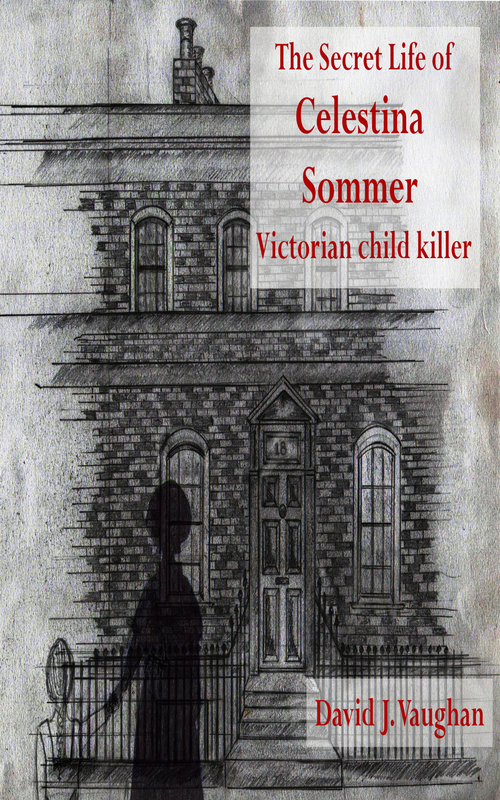 His full-length narrative non-fiction title, ‘The Secret Life of Celestina Sommer, Victorian child killer’, has been self-published on Amazon Kindle etc. Leah Wilkinson was described as a ‘notorious old offender’ by the Navy in 1712. She had a long career as a forger and con-woman – with known criminal offences being committed over a 30 year duration. She made a living by forging wills and letters of attorney for seamen, and was able to carry on this criminal career because of her powers of persuasion and language, undeterred by spells on the pillory. Although biographical details for Leah are few, from my research, it looks like she was born Leah Lowe into a Quaker family in London. She married Samuel Wilkinson in 1688, and they had at least one son. The first time Leah is recorded as appearing at the Old Bailey is on 3 December 1695. She was accused of forging seven letter of attorney and wills, purporting to have been written by various seamen. By forging these documents, she had managed to obtain £200 – around £16,000 or £17,000 in today’s money. She was lucky on this occasion, being acquitted by the court – not because she was found to be innocent, but because there was a mistake in the written indictment of her charge, and so the case could not go ahead . Seamen were targeted by Leah because they were able to appoint attorneys to receive their pay in their absence. These letters of attorney could therefore be forged by those hoping to obtain the seamen’s wages – with them at sea, they would not learn of the deception for some time. Another way to get money – as Leah did – was to add a clause to the letter of attorney, purporting to be a will made by the seamen, whereby ‘they make their attorneys their executors and give the whole estate or great part thereof, the seamen being ignorant’. If the seaman did then die at sea, his relations could end up penniless as a result of these forgeries. Leah didn’t appear before the Old Bailey again until 1727 – but this does not mean she lived a virtuous life until then. She appears in other records, and was clearly up to her old tricks. In fact, she even forged a letter of attorney from her own mother. And in November that year, Whitaker had to write again, warning the Navy Board that ‘Leah Wilkinson, daughter of Anne Low[sic] deceased’ was still employing agents to receive money on her behalf, by naming them in forged letters of attorney. This letter shed light on Leah’s criminal habits – she had learned them from her mother Anne. William Rycroft, a seaman on the Victory ship, had returned to England and gone looking for his owed wages. On him making inquiries, it emerged that in 1692, a false letter of attorney had been honoured, and Anne Lowe had received Rycroft’s wages as a result. Forgery was an offence both in common law and by statute; at common law, forgery was ‘an offence in falsely and fraudulently making or altering any manner of record, or any other authentic matter of a publick nature; as a will and the like’ . Certain classes of forgery were felonies without benefit of clergy, but luckily for Leah, at the time she committed her crimes, they did not come under this category. However, the forging of letters of attorney and wills of seamen was recognized as a growing ‘evil practice’ by the end of the 17th century. Legislation was passed in 1697 to tackle the problem. There is no mention of Leah for the next few years, but there is no evidence that she stopped offending – just that, perhaps, she was more careful for a while. But in January 1712, the London Gazette reported that she was up to her old tricks. Describing her as ‘a notorious Old Offender’ – one has to feel a bit of sympathy with her for that epithet – the Navy Office reported that she had just been convicted at the Old Bailey for publishing a forged Bill of Sale or Assignment for the wages of a dead seaman, John Godfrey. Leah was put in the pillory outside here. But not even a spell in the pillory could stop Leah; presumably she was imprisoned for being unable to pay the statutory fine for her conviction, which suggests that she did not get to profit very much from her crimes. Perhaps, brought up by her mother to forge documents, she was unable, or reluctant, to earn a living any other way. So in 1727, the last mention of Leah came. She appeared at the Old Bailey on a charge of drawing up a counterfeit order to receive the pay of another dead seaman – William Bar. It was noted at her trial that she ‘was one of those vile Persons, who makes a Practice of drawing up false Powers, and Letters of Administration, and thereby cheating and defrauding the Widows of such Seamen as die in the Voyage.’ This trial report gives us the best picture we have of the elderly Leah, and shows how the court view a forger who was also female. This was a self-educated woman, who, through her long criminal career, had learned a lot about the law and legal process. She played on the stereotypes of womanhood and her age, yet her proudly-displayed knowledge of probate put paid to her claims of ignorance. In the end, Leah’s criminal career was probably curtailed by death rather than repentance; it is likely that she died in 1729, being buried in the non-conformist burial ground at Bunhill Fields. Her career had a negative impact on many seamen’s families; but it is impossible not to feel a little bit of admiration at this woman who learned about the law from a somewhat unconventional perspective. 1: Old Bailey Proceedings Online, December 1695, trial of Leah Wilkinson (t16951203-35).